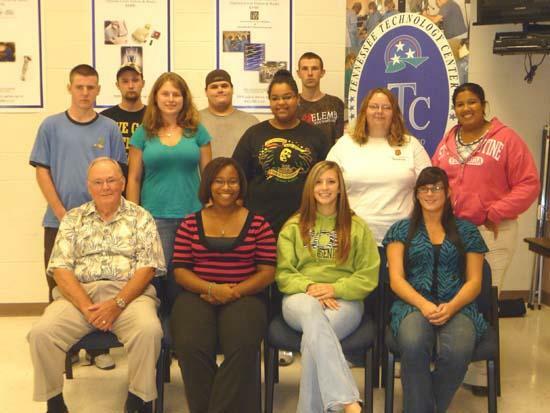 Cannon County High School students who attended the TN Technology Center @ Murfreesboro: Pictured left to right: Front Row Gene McGee (Cannon County Career Training Instructor), Jessica Gaines, Margaret Farless, Candace Coppinger. Back Row Brian Kite, Daniel Matheny, Marissa Norrod, Dillon Swann, Kassandra Price, Gibson Siviter, Brittany Mears, Kayla Leath.Not Pictured: Cody Joyce, Amy Mullican, Ryan Simons. The Upper Cumberland Human Resource Agency, in partnership with the Tennessee Technology Centers at Livingston and Murfreesboro, provided occupational skills training for Career Training students who are enrolled in area high schools. Each student attending the summer training at either technology center campus receives a Certificate of Training upon completion of the four-week session. Credited hours are issued toward future licensing in the student’s area of study so that following graduation from high school, the students may exercise the option of returning as full time students at the TN Technology Center so as to complete requirements for certification. Youth in Cannon County who have a high school diploma, GED or wish to obtain a GED, should call Lillie Vaughn (WIA Case Manager) at the local UCHRA office in Woodbury at (615)563-2916 to learn more about skills training and eligibility requirements.